In the current digital age, the overall notion of how you reach out to customers has changed. Digital marketing has become the core phenomenon for an online business. You cannot just launch an online business and hope the consumers will come on their own. You need to have a marketing plan for targeting your prospective consumers, building a user base and increasing sales. Digital marketing is still at its nascent stage and most online businesses are unable to understand how to conquer it. 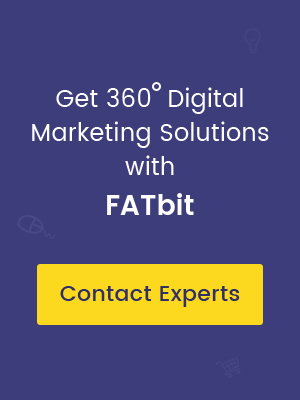 Having helped countless startups reach their targeted userbase, FATbit Technologies surely understands how and what is required to get maximum ROI. There have been several cases where online businesses, despite doing digital marketing, are unable to reap in the benefits. The major reason behind it is not preparing any kind of plan of action. If you have a proper plan in place, it becomes easy when it comes to execution. There are several digital marketing tools that would help you easily create an otherwise formidable plan. Moreover,good planning resonates into better returns. What strategy you should employ? Build an agile and calculated approach to digital marketing. Select target market segments and properly define targeting approach. Define your online value proposition properly including review of your business as well as revenue model. Take into account the 4Ps of marketing – Product, Price, Promotion and Place. Promote your content and draw people towards your website. This is when the consumer is at the exploration stage. This stage involves building awareness about your online business as well as your brand. Your primary aim must be to build traffic towards your overall web presence,including your business site as well as social media pages. This calls for continuous inbound communication as well as planned campaigns. Define a key brand message that will help you make consumers aware about your business as well as increase their purchase intent. Select various channels and platforms where you would target your prospective consumers. Prioritize each channel for spending based on expected returns and effectiveness. Optimize Google AdWords as well as social media marketing. Go full throttle on PR and influencer outreach. Often missed, this stage lies between enticing consumers to visit your website and converting them. This is when the consumer is at the decision making stage. It is all about increasing interactions and persuading site visitors as well as prospects to take the next action that would lead to conversion. Before you employ best practices for conversion, you first need to identify those options. Define consumers’ persona highlighting exactly how and why a buyer would make the decision to buy your products or services. Review the journey of the consumers using Analytics as well as feedback tools. Define all the goals and events offering crucial insights to measure consumer interactions. Improve landing pages as well as personalized onboarding. For online businesses, this stage is extremely crucial as it entails the conversion from lead to sale when consumer is at the purchase stage. After creating interaction with the visitors, online businesses need to put forth certain entities that turn them into paying customers. Review all the conversion funnel of the website and quantify targets. Focus on omni-channel interactions for increasing revenue per visit rather than revenue per user. Define each and every path that leads to purchase. Test CRO via multivariate site and AB testing for best results. Use site personalization, retargeting, and behavioral remarketing. The story for digital marketing does not end at conversion. You need to have a long term engagement plan, where you develop a relationship with the consumers to convert one-time buyers into repeat customers. This can be achieved by social presence, on-site communication and email interaction. This engagement also results in consumers advocating for you, bringingmore consumers. Include a consumer loyalty program and create a consumer engagement plan. Review customer satisfaction drivers and effectiveness of feedback. Consolidate a post sales communication plan via email and social media marketing. Manage social media campaigns by highlighting past customer experiences. Creating or refining a digital marketing plan is just the beginning of the journey towards making the most of digital and social media.You need to have a well laid plan in order to properly capitalize on growing digital marketing trend. As we enter 2018, digital marketing landscape is changing with focus shifting towards mobile and social media. Although the modern digital marketer must take into account each and every channel, having a targeted approach as mentioned in this post is enough to ensure optimal results. Posted in eMarketing, Conversion and tagged as conversion, Digital Marketing Plan by FATbit Chef.